It never fails. If we’re planning on going home for a few days, of course, it is going to snow. Tonight was no different. J and planned weeks ago to take a short vacation and go see our families in Illinois. We thought we’d be out of the worst of winter and things would be ok. Once we started looking at the forecast, we were convinced that someone, somewhere didn’t want us to leave Michigan. The weather looked terrible. Over fifteen inches of snow in a line that was hovering over Southwestern Michigan and Northeast Indiana. We had to go right through it to get home. I started looking at the map and saw we could go down to the Indiana Toll Road and skip a lot of the stuff in Southwest Michigan. It would add about twenty minutes to our trip, but we could be stuck in traffic for a lot longer than that. This way, we wouldn’t hit the snow until we got about an hour from Chicago. The problem with this route, is we’ve never taken it before and we didn’t know where the rest stops were. Usually, we hit the Rest Stop east of Kalamazoo which is a little over an hour into our trip. By then, I’ve already drank a Pepsi and J’s had a Rockstar. An hour into our trip this time, all we found was darkness. We were both getting to the point where we had to pee so bad it hurt, but there was nowhere to get off. We hit the Indiana Toll Road and not long after getting on in Angola, I saw a sign for a travel plaza ten miles down the road. Turns out, that was the only place to get off. So, we stopped at the travel plaza to use the restroom. I was soooo tempted to pick up a burger while we stopped. The plaza had a 24 hour Hardees restaurant. Not sure if there ever was any Hardees in Michigan, but they used to be all over Illinois. They’ve slowly been phased out, but there was still a couple in the Peoria area when we lived there. The stores in Creve Coeur and Eureka, IL (home to Eureka College where President Ronald Regean went to school) are still used as test market stores for the chain which also goes by the name Carl’s Jr. on the west coast. I used to love Hardees. They had the best sandwiches. Then, the chain went downhill and once they were bought by the Carl’s Jr. chain the menu changed. They put the most delicious sandwich ever on their menu. It’s called the Monster Burger. This burger is two 1/3 lb. angus beef patties, four slices of bacon, and three slices of cheese. Sounds delicuos, doesn’t it? Just don’t expect to eat anything else the rest of the day. It’s a whopping 1,420 calories…and that’s before fries and a Coke. We passed. It was tough. Hardees isn’t a chain that I can eat at whenever I want to anymore, so seeing a Hardees alongside the road made me crave a burger. We still had a long trip and loading up on a greasy burger probably wasn’t a good idea. We took care of business then got back on the road. Dipping down to Indiana was probably a really good idea. We got 11 miles from I-94 near Gary, IN before we hit snow…but we hit massive snow. Valparaiso got 25 inches of snow….Laporte got 19. We were going through the middle of it. It took over an hour to go ten miles. There was at least a foot of snow on the road. Had we gone through Southwest Michigan, we would of picked it up near Kalamazoo and been in it all the way to Illinois. No. No point. It’s my blog. I can write about whatever I want. 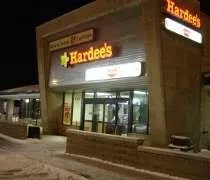 There is a Hardee’s in Owosso, MI.